My name is Phil Miles and I live in a wonderful little place called Rubyvale, located within the Gemfields in Central Queensland, Australia. There is no light pollution and we have no close neighbours, making it a perfect place to indulge in my passion for astronomy. I first visited the area on holiday with my wife in 1970 to search for sapphires (precious gemstones which the region is famous for). We found a few but never made our fortune, so with a family to support I picked up my tools and resumed work as an electrician, before later branching out into computer and satellite work. Now semi-retired with several grandchildren it’s time to relax and enjoy the good life. My interest in astronomy started relatively late in life – many other interests including fishing, target rifle shooting and gemology. Also working, bringing up a family with my wife Diane and building our own home took precedence. However, one evening in 1998 I took my spotting scope into the bush near our home and looking up at the moon, I was enthralled at the detail I could see. Soon after I fashioned a metal bracket to hold a cheap digital camera and my astroimaging journey had begun. In 2005 I bought my first telescope, a second-hand 5” Meade on a tripod, which introduced me to the wonders of the planets and stars. Using a better camera and spending more time, I became obsessed with the details that a reasonably good image produced. This culminated in the decision in 2010 to buy a bigger telescope and house it in its own observatory. Luck was around when a few months later a new 14” Meade became available in my local town at a reduced price. 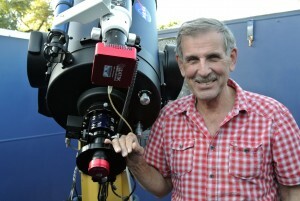 In 2013, Anthony Wesley visited Rubyvale for an astroimaging holiday. I was fortunate enough to spend a great deal of time looking over his shoulder and asking numerous questions. His website displays some of the best planetary images ever taken. So with this fantastic start, I decided planetary imaging was for me and my education began in earnest. Little did I know how big a journey I was starting out on, but every journey begins with a first step and that step has been taken. Check out my images and follow my progress as I attempt to emulate the best.